As we near the halfway point of the 12 Days, it's time to twist the grip on this sucker, and the Works Connection Elite Throttle Tube makes that an easy task. It’s that time again! As we head into the holiday shopping season, some of our favorite brands are here to help out with gift ideas as you hunt for the perfect items for people on your Nice list. As a bonus, we’re also giving away all the goodies you’ll see over the 12 Days to the readers on Vital MX. How do you enter? Simply leave a comment at the bottom of each day’s page. That’s one entry (and one only) per person for day one, one for day two, etc. Yep, you have to be a member, but it’s fast and free to sign up. We'll pick winners before Christmas. The Works Connection Elite Throttle Tube ($69.95) is designerd for use with a stock throttle housing, and consists of a CNC-machined aluminum throttle that includes a sealed bearing inside the end of the tube, and combined with an internal polymer bushing to create buttery-smooth throttle action. 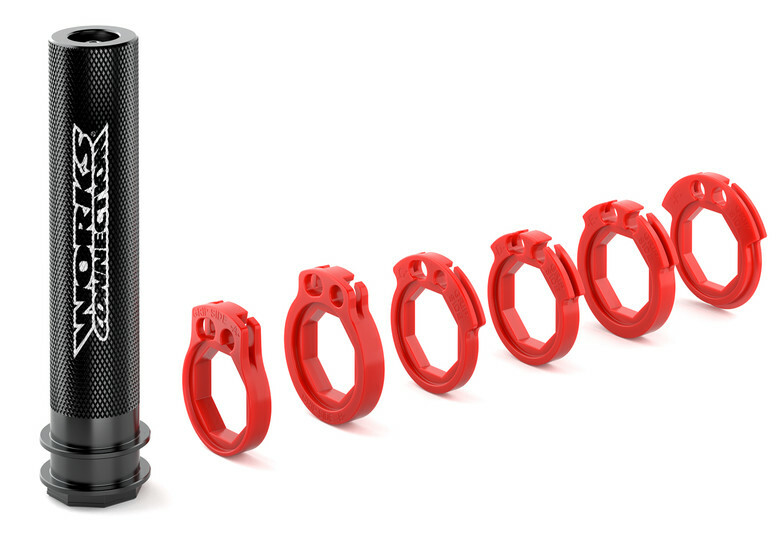 Also included are six Delrin® snap-on cam pulleys that are designed to match the OEM/stock pull ratio. The cams included in the kit cover the complete line of MX and off-road, race 4-stroke models from Honda, Husqvarna, Kawasaki, KTM, Suzuki and Yamaha. I would like this for my YZ. as much as I tip over this could be good! I'd still find a way to break it. I'm always up for twisting one to the stops. Love it. Would like to see how it feel on the track. Time to twist it to the moon! Thanks vital and works connection! That is trick stuff right there! Almost half way for GuyB to pick a guy with the last name of B! I don't think I could ride anymore without it. Going to work good on my SX150 ! Twist it on a 2-Stroke! Grip it and rip it. My throttle is always stickin' That's what happens when you hold it WFO! All Works Connection products are "Elite"
If you pick me I promise to love you forever. Always wanted to do a throttle upgrade. Works connection is possibly the most used component upgrade on a bike. What what!! 12 days of xmas! Yes please, definitely need one of these. Merry Christmas, I never win anything but maybe miracles happen! Full gas with works connection! Curious what sort of upgrade this would end up feeling like. All the heart eyes for works connection. That would be awesome under the tree!! Tired of changing the kid’s broken tubes! This a life changer. Hope this make it easier for me to hold the throttle open. Brap! This gift idea really turns me on!!!! Works Connection always makes good stuff! Let’s get it! Wide open throttle here we come. Thanks for doing this every year. My YZ really needs this. I want to try all of the different turn options. Super intriguing with the wide variety of options! New bike could use this as an accessory. The bike I’m rebuilding this winter would look nice with this on it. I don't own a 4 stroke but I will take a shot at this. If santa draws my name It will end up in for sale/bazaar section and whatever is offered goes to R2R. yes please,so I can pin it! WC is always ahead of the game! Thank you for the opportunity Vital! Twist it to go fast! This would be awesome on my yz! Those would be sweet!! Can you use these with bark busters? This is a dire need item for the museum piece ! Is this left handed or right handed? Asking for a friend. Exactly what my bike needs ! Perfect! My teammate broke mine at DITD. Love me some made in the USofA! Been wondering if trying a different "cam" (?) would be what I have been looking for throttle response. High quality stuff that I've trusted for years. Saves me from the broken plastic whiskey throttle! I could use five of these!! !